Wednesday, 2 April 2014: One Year and One Day Old. I can’t believe we have a one year old! I think I was too busy yesterday to realise the significance of it all but today it hit me like a tonne of bricks. Judging by how quickly the past twelve months have gone I can only imagine the next year will fly by even faster, then the one after will shoot past… and I can almost see the years tick over as Ayla gets older! Our little family has so much to look forward to over the next twelve months; walking, talking, sleeping through the night (please, oh please! ), learning to paint and draw, and making friends. It amazes me just how many “firsts” Ayla still has to go through, and how the greatness of each milestone she achieves will so quickly be overshadowed by another. I love watching my baby girl grow and develop, but at the same time I revel in her newness and dread the day it will be gone. But for now, every new day seems like a new chapter in the best book I’ve ever read; I can’t put it down, I can’t wait to find out what happens next and I never want to finish it. 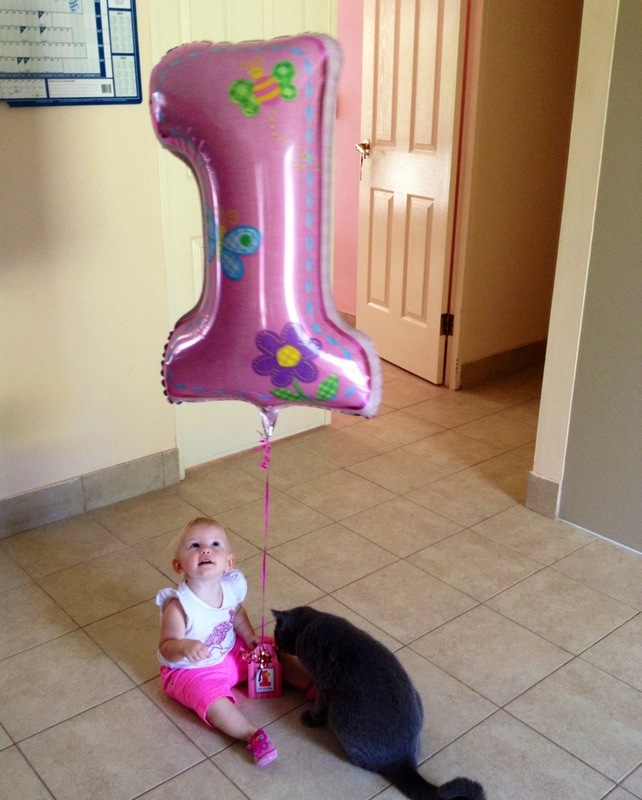 Tuesday, 1 April 2014: One Year Old. I think Ayla’s had a pretty good first birthday! We got up late and had a big breaky, then headed to a kids play gym for a catch up with some of Ayla’s little friends. Ayla had a ball in the “big kids” section, and she even had her first ride in a coin operated machine! After a big nap at home it was off to day care for a few hours in the afternoon where the day care mums made a big fuss. One of the best parts of the day was when Daddy came home from work and we all relaxed in the pool and shared stories of our day. Just before dinner it was time for presents and my gosh were there lots! From a trike to a peg-puzzle, from an artwork for her wall to some gorgeous clothes and more, Ayla was rolling in gifts. Hubby and I gave Ayla a miniature grand piano and the look on her face when she worked out how to play it was absolutely priceless! Ayla banged away on the piano keys like a mini maestro for ages, and a no matter how many times we tried to distract her within seconds she was back to play some more. 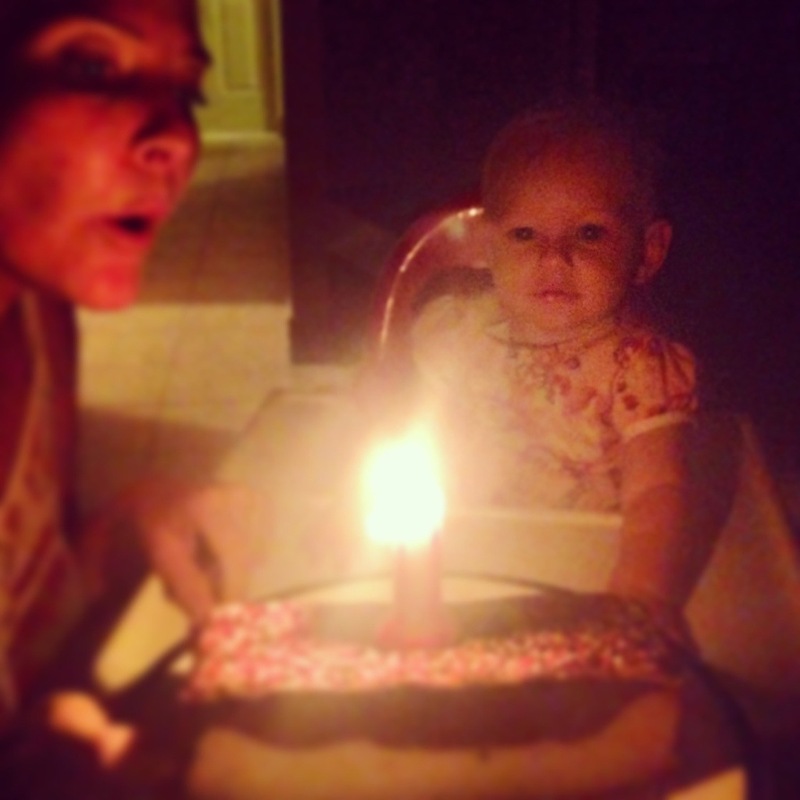 Ayla’s first birthday ended, of course, with a birthday cake complete with a “1” candle, a happy birthday song and lots of kisses.